Recently a guest requested “Tuna Crudo” as part of their multi-course tasting menu. The use of the term “Crudo” versus “Carpaccio” or “Sashimi” made me curious as to whether there was a fundamental difference between the preparations. Crudo, which means “raw” in Italian, can encompass minced, diced, or sliced proteins. 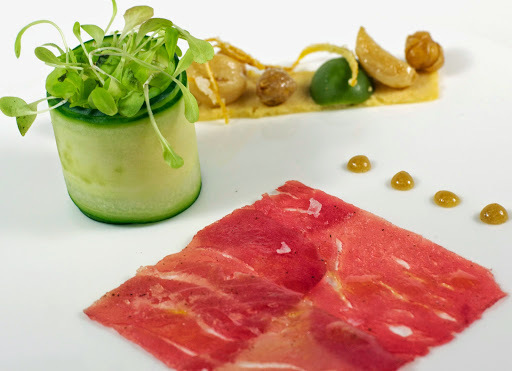 Carpaccio, which means “skin”, generally means that items have been sliced to the thinness of a layer of skin. So, from my estimation, the slice of tuna loin on our dish could have been presented as either crudo or carpaccio. When exploring the meaning of sashimi, it seems that sashimi is defined not only by the freshness and quality of the fish, but by the mastery demonstrated when slicing it by hand. Ours was sliced on a meat slicer, which of course disqualifies it from consideration as being sashimi. In looking at traditional preparations of Crudo, it became clear that the idea of Crudo is to enjoy exploring the flavors of raw fish with equally high quality ingredients, such as extra virgin olive oil and sea salt, and exploring how the flavors of the fish interact with other elements of the dish. So that is how this dish took shape; an excellent piece of raw tuna on the plate, sliced thinly enough to melt on the palate, paired with an array of delicately-portioned, big-flavored ingredients. The components on this dish are many: Baby greens, lemon-thyme vinaigrette, seasoned cucumber, oil, coarse sea salt, freshly ground black pepper, roasted garlic cloves, fried chickpea, honey-tahini, hummus and candied lemon zest. However, the main attraction is the tuna and this dish was built around its meaty presence. In order to produce this dish en masse, the tuna loin was frozen and then sliced thinly on a meat slicer. It was placed on parchment paper which was greased with salad oil, then seasoned with freshly ground black pepper. While I would have liked to have used a higher grade olive oil, I couldn’t risk the acidity of an olive oil as it would begin to denature, or “cook”, the protein. 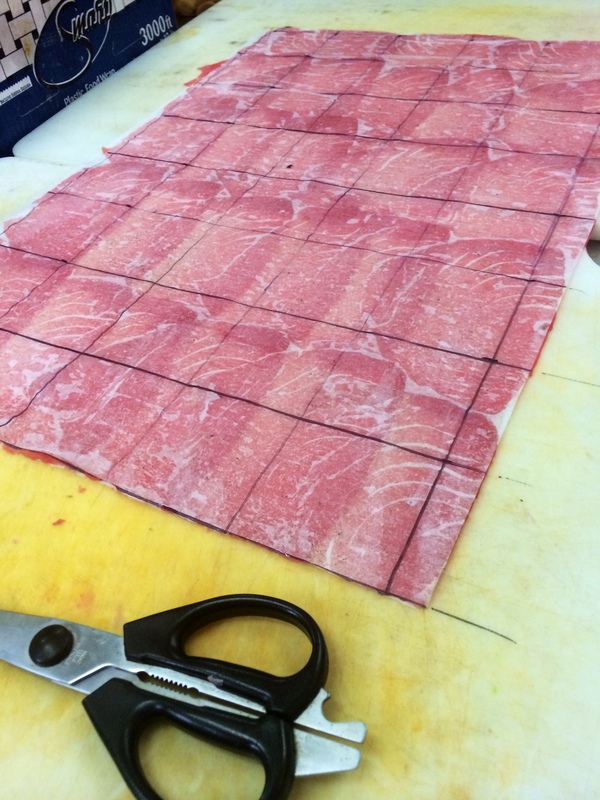 Once the tuna was arranged on the parchment, a yard stick and a Sharpie were employed to mark off a grid for portioning (see below). Very sharp kitchen shears worked well to portion the tuna without tearing the paper-thin meat. The individual squares were then held for service and the parchment made plating extremely efficient. The result was thin, rosy, uniform slices of tuna which were well-received by our guests. Lastly, thank you to Chef Hannah Yerby, who assisted greatly in producing and assembling this dish. Chef Hannah has since moved on to Texas for the next phase of her career. Her influence on our food will be missed and we wish her the best as she moves forward! Posted in Appetizer, Seafood, Spring, VegetableTagged carpaccio, chickpea, extra virgin olive oil, garlic, greens, hummus, lemon, meat slicer, tuna, Tuna Crudo, vinaigretteBookmark the permalink.